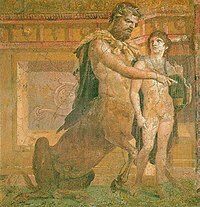 Chiron, the centaur from Greek mythology, teaching the young Achilles to play the lyre. A lyre (pronounce to rhyme with "fire") is an instrument which is like a mixture between a harp and a guitar. It is held in one hand and the strings are strummed using the other hand. Lyres were among the first string instruments to be invented. This page was last changed on 21 August 2016, at 06:48.